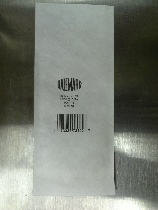 Table top Tyvek pouch thermal transfer printing equipment for UDI compliance for printing machine readable labels. Will print all style of bar codes including 2D bar codes, will also inspect/verify bar codes. Will print with a thermal transfer printer directly on Tyvek pouches, medical grade paper pouches and Tyvek lidding without using a label. It can also print on items as thick as card stock and blister cards. It can also print on flat folded boxes too. 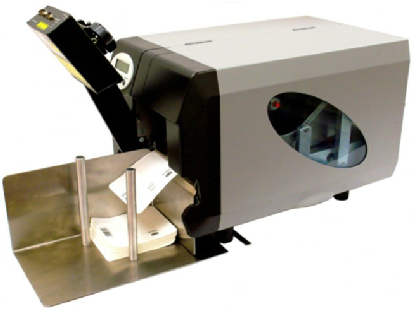 The cleanroom compatible machine feeds pouches (or Tyvek die cut lidding) from a magazine, and with a high definition thermal transfer printer prints directly on a Tyvek pouch. 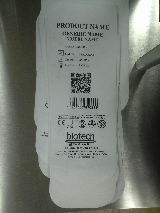 This eliminates using a separate label to print information on Tyvek and foil laminate pouches. Printing directly on the pouch or die cut lid reduces labor costs for applying labels, and the cost of the label. It also maintains the breath-ability of Tyvek, since there is no label that will block the permeability of EtO gas into the pouch or through the Tyvek lid. Optional Vision System is available for 100% inspection. This can also perform a Bar Code Read and Verification as well as pixel match on all copy within the depth of field set by the customer.